"These cookies are green oatmeal cookies-without adding any food coloring!" Good cookie with a cake-like texture, recipe called for too many chocolate chips - I think 1.5 cups would be about right. I LOVED these cookies. Took them to work and everybody there loved them too. 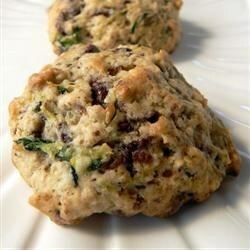 The zucchini added just enough green without overpowering the cookie. I will defintely make these cookies again. I made these from St. Paddy's day last year and the kids LOVED them!! I put in green food coloring so that they would be really green! Great recipe will make again this year!